In project management, engineers have long told project managers that they can have it: Fast, Cheap, or Good – pick any two. The idea is that the creation of a new product requires trade-offs between these three elements. For each element that you want more of, you need to compromise by having less of another. For example, if you want it fast and good, you need to compromise by spending more money (for more information Google "Project Management Triangle"). Recently, I have been involved in several different eLearning projects and I have been reflecting on how the project manage mange triangle applies to eLearning. 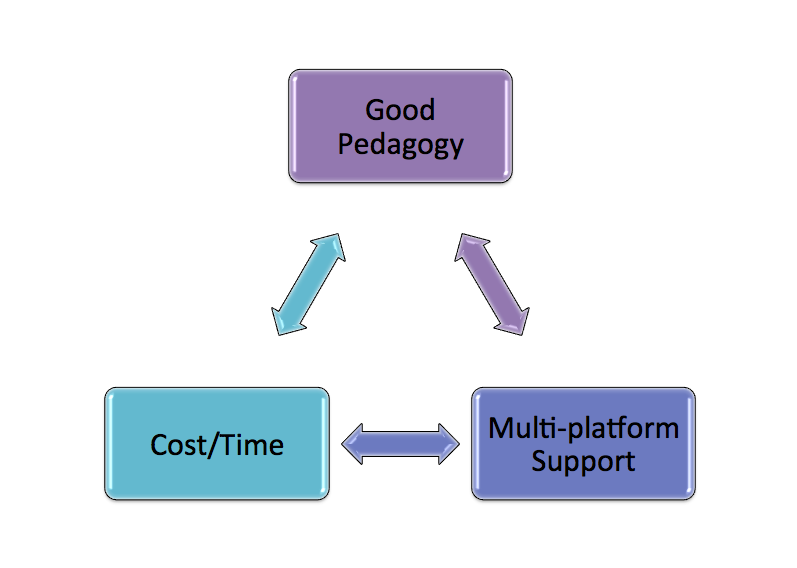 In my view, there are three key factors in the design and development of new eLearning: good pedagogy, multi-platform support, and cost/time. I describe each of these below. 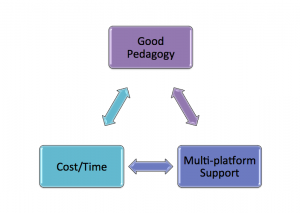 Good pedagogy refers to creating engaging eLearning. What is engaging? Cathy Moore (http://blog.cathy-moore.com/) does a great job of providing one technique (action mapping) for designing engaging eLearning. The idea is to avoid creating eLearning that is simply a knowledge dump, and to try engage the learner in the content. Engaging eLearning also provides the learner with job aids, that can help them apply the learning to their real world context. Multi-platform support refers to the ability to access the eLearning from different devices, such as PC, Mac, tablets, and SmartPhones. Cost/Time refers to the ability to develop eLearning quickly in a cost effective manner. Unlike the project management triangle, I lump these two into the same item as I believe the two are so tightly coupled that they go hand-in-hand. The use of a rapid eLearning tool such as Articulate Storyline, Adobe Captivate, and Trivantis Lectora allow you to delivery eLearning faster and with lower development costs. Like the project management triangle, these three items form a triangle of trade-offs. For each one that you prioritize, you need to compromise by having lesser of one of the others. For example, if you want true multi-platform support, then you need to create different learning designs for each of the platforms. Each platform that you support limits the type of interactions you can include in your learning, so you need to adapt the design for each platform (e.g. if you are designing for a Mac or PC, you can provide Word documents as job aids, if you are designing for a tablet you can create interactive check lists as job aids). In addition, if you customize your design for each platform, you increase the cost/time to deploy. Rapid eLearning tools allow you to develop eLearning with a lot less effort; however, they are not without their limitations. Each tool is has been created with certain features as a priority. None of them do everything well, and each has its foibles or issues. However, using a rapid eLearning tool allows you do develop something quickly that is easily editable/updatable. Programming eLearning without a rapid authoring tool gives you unlimited flexibility, but it will also take a lot of time and will more difficult to update or maintain. great article about elearning projectment management!